After a week of debate with the EU and attempts to get additional money from Russian partners, Cyprus had to yield to the demands from Brussels and Berlin and will restructure its banking system, thus inflicting heavy losses on big depositors. Analysts believe this restriction on capital movement may herald the collapse of the eurozone. This resolute attitude on the part of EU officials has caused major concerns on European markets: What if the financial escalation in Cyprus is just the first step in Brussels’ campaign to simulate the possible aftermath of the disintegration of the eurozone? Yet it will be Russian depositors that will foot the bill. Cypriot banks hold an estimated €68 billion ($87.1 billion) in deposits and Russian companies and individuals alone are said to hold more than €30 billion ($38.4 billion) in local banks. 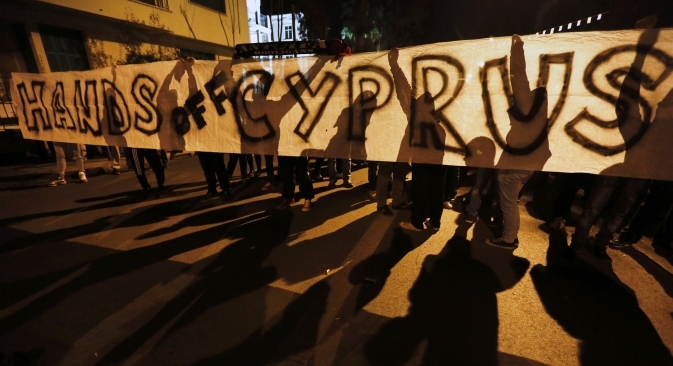 The €10-billion ($12.8-billion) bailout for Cyprus is a death sentence for the island. Newly-elected President Nicos Anastasiades probably had to make the hardest decision of his life, effectively terminating the country’s most profitable offshore status. For the first time in the history of the eurozone, national banking institutions are to be rescued by their depositors, who were deliberately put at risk, rather than the shareholders and creditors, who will nevertheless be unable to recover their investments. The EU and Cyprus have agreed that only the most well-off savers will suffer, as only those holding more than €100,000 ($128,420) with the country’s two biggest banks — the Bank of Cyprus and Cyprus Popular Bank (Laiki) — will be subject to the levy. Whereas the clients of the former may face haircuts of up to 30 percent of their deposits, the customers of Laiki, which had lost €1.8 billion ($2.3 billion) by September 2012, may have to say goodbye to all their savings. As of today, Russian businesses and officials have no clear idea of the scale of the losses that domestic savers may suffer, as has been confirmed by First Deputy Prime Minister Igor Shuvalov. The most recent, unofficial estimate is approximately €4 billion ($5.1 billion) in losses. However, Evgeny Tarzimanov at Moody’s Moscow office believes this forecast to be optimistic. According to some reports, Russian depositors may lose up to 50 percent of their savings. Russian sources on the island say that Russian companies working in Cyprus, accumulating financial resources and making investments will be worst hit. Experts believe that the tough stance taken by Berlin, which has long insisted (albeit unsuccessfully) on making business transparent in Cyprus, has finally helped Germany kill two birds with one stone. The EU will not only deal with Cyprus’s financial trouble but also dramatically reduce its investment appeal — especially for Russian business. “We hope that the Cypriot banking system will manage to avert capital flight; even so, we have no hope of new capital inflows. Berlin managed to have it its way, but Germany’s claims against the island are unwarranted,” says Piraeus Bank CEO Constantinos Loizides, who managed to keep his savers’ funds safe, unlike the executives of Laiki and Bank of Cyprus. The situation surrounding Cyprus with its non-operating banks, savers’ losses and capital controls — which run counter to the fundamental principles of the EU — have prompted some experts to say that Cyprus might just be a rehearsal for collapse of the single European currency. “The most important characteristic of a monetary union is the ability to move money — without any restrictions — from one bank to another within the currency area," says Guntram Wolff, deputy director of the Bruegel think-tank. "With capital restrictions, the value of the euro in Cyprus is no longer the same as a euro held by any other bank in the eurozone. Effectively, it means that a Cypriot euro is not a euro any more. By imposing restrictions on capital flows, the ECB has effectively introduced a new currency in Cyprus,” Wolff added. Strange as it may seem, this is how the euro will die — the eurozone members will not announce their withdrawal from the bloc (given that there is no procedure for cessation of membership in the eurozone), but instead will impose restraints on capital movement and shut national banking systems along state borders. Analysts believe that this stand by Brussels may be interpreted as a signal for the PIIGS countries (Portugal, Ireland, Italy, Greece, Spain), which may be in for a mass panic among investors and capital flight. If EU officials try to impose controls on capital movement again, the European currency as it is now will never be the same again.